Hawaii Island is an incredible collection of many diverse micro-environments, each with its own weather. You can travel through all but two of the world’s different climate zones on Hawaii ranging from Wet Tropical to Polar Tundra, a result of the shielding effect and elevations of the massive volcanoes Maunakea and Maunaloa. Experience this for yourself as you explore Hawaii Island by car or helicopter. See the tropical rainforests in the Hamakua Coast, the cool uplands of Waimea, the volcanic deserts of Kau and the sunny beaches of Kona, all within the span of a day’s drive. While it's always going to be close to impossible to predict the weather months or even weeks ahead of your vacation, you can look at past Hawaii weather and climatic variables to determine what is likely to occur. Below we'll go over some of the most common concerns about Hawai'i weather. If nothing else, you'll have a general idea of what to expect. As always, be sure to check local weather through the TV stations during your stay for day to day updates. Avoid the Weather Channel's web site, they'll say it's going to rain every day. It's not. The best thing about Hawai'i's weather is that it is very localized. You may be driving along the island and be in a rain storm one minute and in bright sun the next. This variety of weather allows you to fully experience Hawai'i and its sun-drenched beaches, misty rainbow-filled valleys, pristine waterfalls, cool highlands, and lush mountains. The chart shows the distribution of precipitation annually on the islands; click the chart to enlarge it. Hawaii, like all the other major Hawaiian islands, is affected by the trade winds. These winds blow NE to ENE and are typically more prevalent in the winter months. These trade winds bring cool air to the islands from the north, often resulting in precipitation along mauka and windward areas. At times, these winds can die down and practically reverse so that a south wind blows over the islands, resulting in very hot and muggy conditions. These winds are called Kona winds. One mistake a lot of people make when they visit Hawai'i is assuming there is a wet and/or dry season like back home, but it's not quite that simple. Granted, there are two distinct times of year and weather patterns due to the trade winds, but there is no defined "rainy season." The general point to be made is, you can't just say it's rainy in the winter and dry in the summer. We've seen it bone dry in the winter, and had flooding in the summer; each enough times to derail most short-term trends. Still, we can look at the long term trends and get a general idea of what to expect. Let's take a look. On average, the summer months are the driest and sunniest, but they are also the most humid and warmest. The winter months usually bring more rain to the windward side of the islands, north and east, but prolonged rain storms are uncommon. Make note of the difference between the Big Island's Rainbow Falls in winter (right) and summer (left) - this is due to rainfall differences. The southern coasts of each island are the driest parts year round. Also, consider that Hawai'i is geographically and topographically one of the most diverse places you'll ever find. The weather from one side of an island to the other varies greatly over distance and the topography present. Since weather can be so unpredictable in Hawai'i, keeping a small poncho with you during hikes or other outdoor activities might be a good idea. Unless you hike into any valleys, where clouds can build up and stick around a while, you're likely only to experience rain in short spells. Hawai'i is fortunate in that it has a mild and pleasant temperature throughout the year, the largest complaint likely being the humidity for those not used to it. There is hardly any difference between night and day temperatures year round. The occasional storm or the trade winds are the exception to the rule, but even then temperatures don't vary by much. The average high and low in the summer are around 85 and 71 respectively, while the average high and low in the winter are 78 and 62 respectively. The temperature estimates only apply near sea level, please keep in mind that elevation changes will alter the temperatures. With every 1,000 foot climb in elevation, the temperature, on average, drops another 3.5 degrees. We strongly urge visitors to take note that certain islands have topography that changes often, as does elevation. If you plan to visit the summit's of Haleakala on Maui or Mauna Kea on the Big Island, you'll also need to prepare accordingly as temperatures between 10,000-14,000 feet can be downright cold even in the summer months. We advise against winter travel to the summits on the Big Island, as blizzards are not uncommon there. Ultimately our message is simple. Keep the topography and elevation of where you are traveling in mind and prepare accordingly. Even if you do not plan to visit the summit areas on Maui or the Big Island (or visit either of these islands at all), a light jacket might be useful in other areas around the island you're visiting where elevation is above three to four thousand feet. Jackets or light sweaters are also useful for any dawn/dusk hiking at higher elevations, like Koke'e on Kauai or Hawai'i Volcanoes Park on the Big Island. If it's the ocean temperatures you're wondering about, rest assured you'll find warm temperatures year round. Ocean temperatures remain pretty comfortable throughout the year ranging from 80 degrees in the summer to a milder 74 in the winter. These two weather systems/events both have an impact on the islands. During El Nino winters, the islands are typically drier. Whereas in La Nina years, rainfall in Hawaii has tended to be near to above normal during the winter months. The rainy season has also lasted longer into the spring during La Nina years. 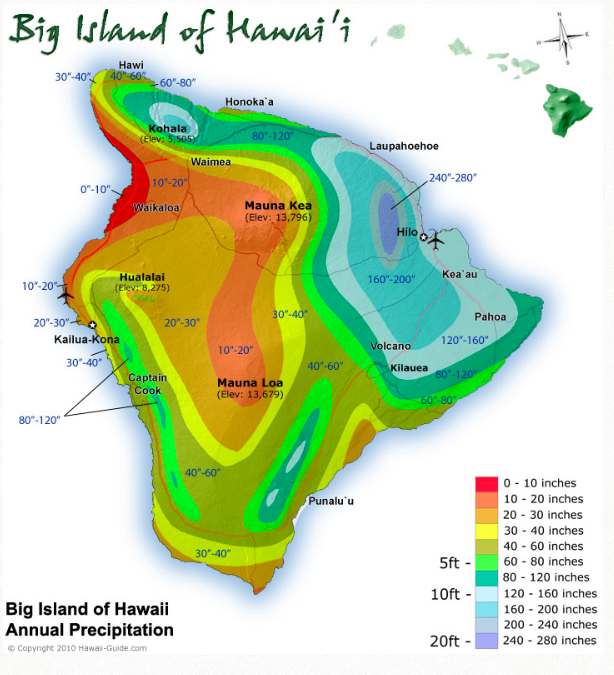 Hawaii may receive above normal rainfall not only during the normally wet period of January through March but, during a strong La Nina period, the excess wetness may continue through May in many locations.